Please join us for an All-Inclusive Weekend Getaway on the island. 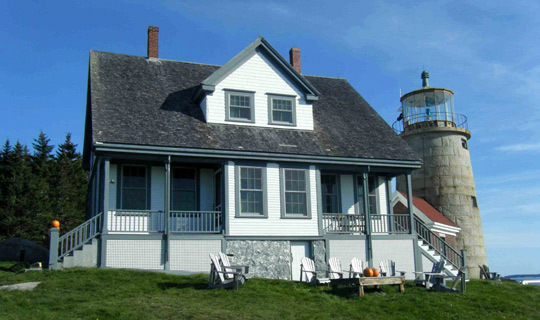 Stay in the historic Light Keeper's House and allow yourself to leave the busy life of the mainland behind. This vacation package is available for $699 per room based on double occupancy, $589 per room for single occupancy, plus 9% Maine state lodging tax. You can add a Friday night stay for an additional $150 (includes dinner Friday evening). If you are flying into Rockland or Portland Jetport, we can arrange to pick you up. Parking is available at our dock in Spruce Head, where passengers will board our boat and depart on the 15 minute trip out to this island. If you have any questions, email info@whiteheadlightstation.org or call (207) 200-7WLS (7957). Sorry! All our rooms have been reserved; however if you want to put your name on a waiting list (should anyone cancel their reservation), please fill out the registration form below.